Are pocket hard drives, WD's forté? Western Digital is the latest drive maker to offer pocket-friendly storage that triggers a charity donation every time one's purchased. Like Sony, Belkin, Seagate and other before it, WD's targeting Breast Cancer, but it's not going to stop giving after a month. 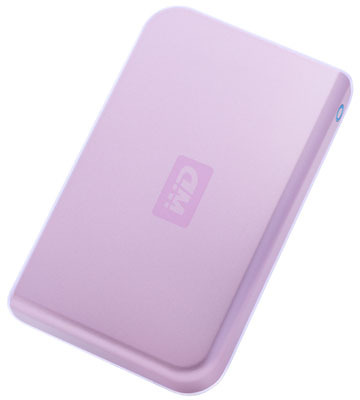 Register Hardware readers know I'm no fan of pink products, but I'll make an exception for WD's metallic pink Passport pocket drive because it's for such a good cause. The handheld hard drive comes with a 250GB capacity, WD said, but it was tight-lipped about how much it'll give to the US National Breast Cancer Foundation every time somebody buys one. However, it did say it will keep on making donations through to the end of February 2008, not just for a month like some of those rose-tinted products released for Breast Cancer Awareness Month. So I'd encourage all of you to splash out on one for the woman in your life, perhaps as a Christmas pressie - we know how hard it is to think of something original that she might like. Knowing techie males, it'll be accompanied on The Big Day by a lecture on the importance of regular back-ups. I know, now we'll have no excuse, and those 250 gigabytes should be plenty for all of us laptop-toting ladies. There are 120GB and 160GB versions too, but only the 250GB model is available now, from WD's US website. Next month, all the three versions will go on sale in Best Buy stores. Is that 2TB in your pocket or are you just pleased to see me?